The photos are in. The votes are tallied. The winners have been selected. But before we get to the results of our Holiday Beertography Challenge, we’d like to extend a HUGE thank you to everyone who took the time to capture their holiday moment with an Anchor brew and share it with us. We love your passion for our beers, and for craft beer in general, and we appreciate you participating. The people have spoken! 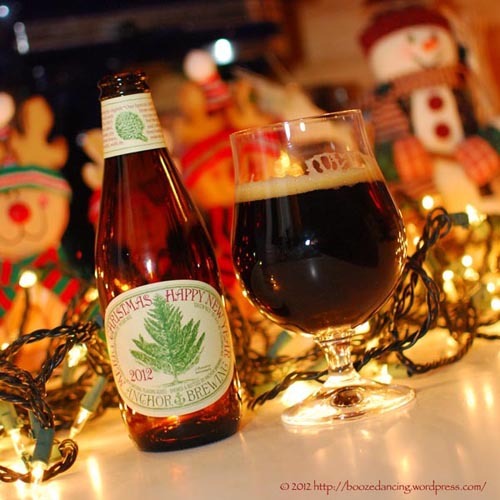 Members of our Facebook community selected Patrick Buganski’s photo of Anchor Christmas Ale in front of the Christmas tree as the winner of our People’s Choice Award. Congrats, Patrick! With so many great entries, it certainly wasn’t easy to choose just *one* photo for our Brewer’s Choice Award. 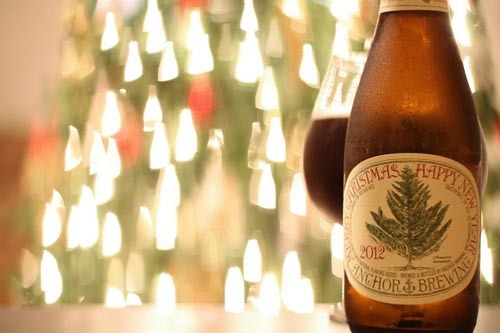 We thought Angelo’s photo of 2012 Anchor Christmas Ale did a great job of showcasing the beer, while the lights and festive background captured the spirit of the holiday season. Well done, Angelo! After selecting the winner for our Brewer’s Choice Award, we wanted to recognize Scott’s entry with an Honorable Mention for his creative photo featuring a bottle of 2011 Anchor Christmas Ale. The Great Basin Bristlecone Pine on the label appears to “grow” in place of a previously-cut Christmas tree. A comment from Bob Brewer: “The smell of pine needles, tree sap and sawdust along with the chill in the air is an indelible memory of the season.” As far as we know, no trees were harmed in the process of capturing the photo. Great photo, Scott! Congratulations to our winners, and thanks again to all of the great “beertographers” who submitted photos. We had a lot of fun seeing your creativity in action. 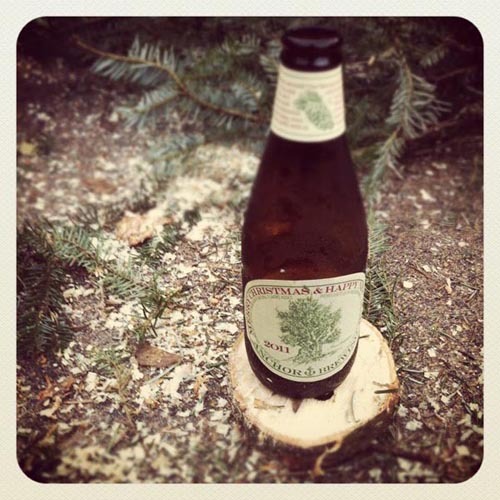 Even though the Holiday Beertography Challenge is over, we hope you’ll keep the great Anchor Beertography coming! Share your photos of Anchor brews with us on our Facebook or Google+ pages, or tag us with @AnchorBrewing on Twitter or Instagram and we’ll continue to share our favorites with our online community. Cheers, and Happy New Year!